Cheesetastic news! (How cheesy is that?) 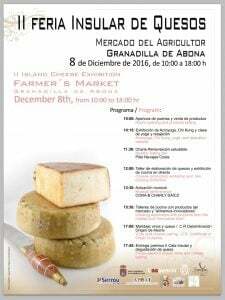 The second Traditional Craft Cheese market will be taking place on the 8th December in Granadilla de Abona, showcasing the finest handmade cheeses in the land. The fair has many activities such as workshops, talks, exhibitions, live music and a competition for the best cheese. So for all you cheese-lovers out there - why not come and sample some craft cheese and take some home for the Christmas period. The fair begins at 10am on Thursday 8th December and finishes at 6pm.